Coriander are the seeds from a cilantro plant. 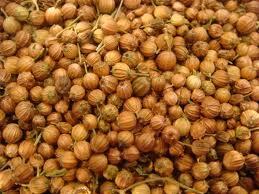 Coriander seeds are commonly used in East Indian and Mexican cuisine and can also be added to pickling brines. Typically the seeds are toasted and crushed or ground into a powder before adding to a dish. If you use a lot of fresh cilantro in your cooking, the seeds can be planted and placed in a bright/warm windowsill, watch them grow.